Oct 10, 2018: Ms. Chloe Ding, Manager Marketing at SHU-UTS SILC Business School, and Ms. Emma Liu, Manager of International Affairs at SHU-UTS Business School, came to visit the beautiful campus of our institution and to discuss future exchange possibilities for our students. As a courtesy of our partner institution, they sent their representatives to explore possible avenues to activate faculty exchange, undergraduate exchange programs and summer exchange programs. They also discussed the possibility of two way exchange between the two universities. 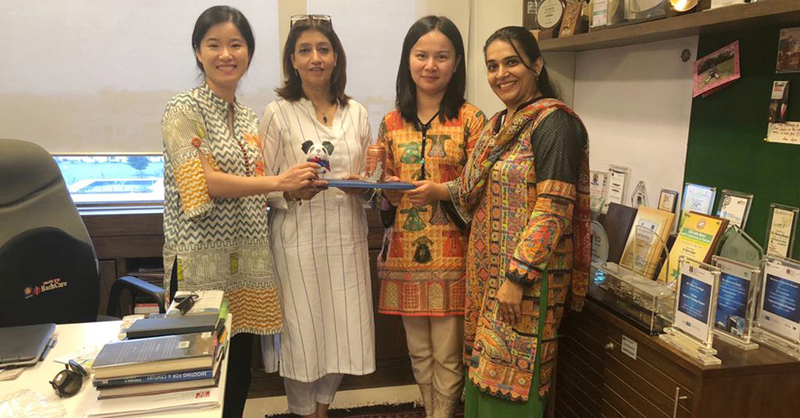 Ms. Chloe and Ms. Emma met with Dr. Huma Baqai, Dr. Nasir Afghan, Dr. Ahmad Junaid and Ms. Shehreena Amin to discuss the possible avenues for students at SILC University. The option of IESS-IBA (International Entrepreneurship Summer School) was given to them and a suggestion for customized programs for their non-entrepreneurship students was also presented. They also talked about strengthening the partnership by opening more opportunities for our students and faculty at SILC University. The suggestions included: summer exchange, faculty exchange and undergraduate exchange programs. We are proud to say that they were immensely impressed by the layout of our campus and the resources provided to our students. After their visit to the IBA Main Campus, our guide took them for sight-seeing and exploring the culture of Pakistan.